Most of mobile testing tools provide various useful features for testers and developers. However, they forget about the project managers and the latest had to search for additional tools to manage the testers’ performance. Ubertesters makes the life of the project managers easier by providing possibilities to check what and when was done by a tester and the general statistics. Would you like to know who is working hard among your testers? Would you like to know who is reporting serious bugs and what he’s checking? Use the options provided under Activity tab of the Ubertesters menu. How to manage and control your testing process with Ubertesters? To check what’s done on the project, a manager should navigate Projects at the top of the page, select the project and click ‘Activity’ tab. Activity sorted by member and device. ‘Summary’ section provides you with the information about the total number of testing sessions, reported issues and crashes. The current testing sessions and recent activity performed over the project right now is also there. Monitor, how many of your testers are testing the app right now. Newly presented ‘Recent activity’ feature allows you to get the detailed report over the whole activity that is taken place over the project. The option is accessible for all project members, however the type of information provided there depends on member’s role. Crash is reported by member. Click on ‘History’ tab or scroll down the page and click on ‘Show more’ to get more results. 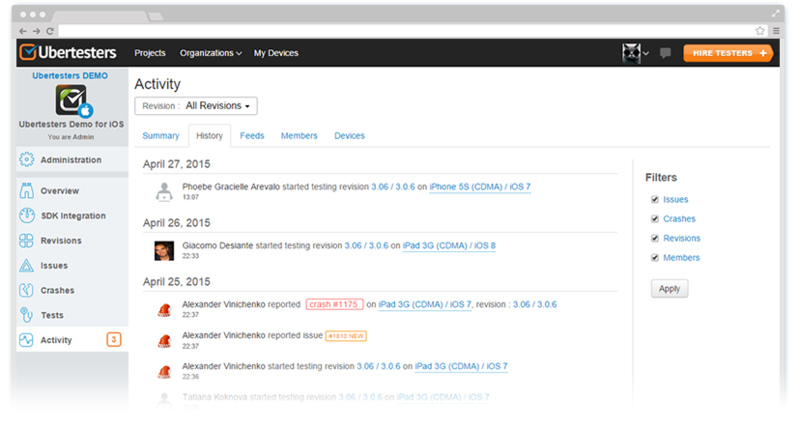 Here you can filter the results by Issues, Crashes, Revisions and members. If you need to check the testing session feeds, select ‘Feed’ tab. The feeds are represent the ‘device – member – revision’ joint. That means 1 feed includes all the testing sessions for 1 revision performed from concrete device by a particular member. Click on the required line to get the detailed info. To check the details of the particular session, click on the selected session under Activity Stream. Check the members and their activity in ‘Members’ tab. What is the member’s role? How many installations was done on the testers’ device? How many sessions he had? How many issues were reported? All this info is available here. Would you like to test the app on the device with a particular device or a specific OS version? Access ‘Devices’ tab to sort the devices by model, OS version, number of reported issues and crashes. The device owner is also listed there. 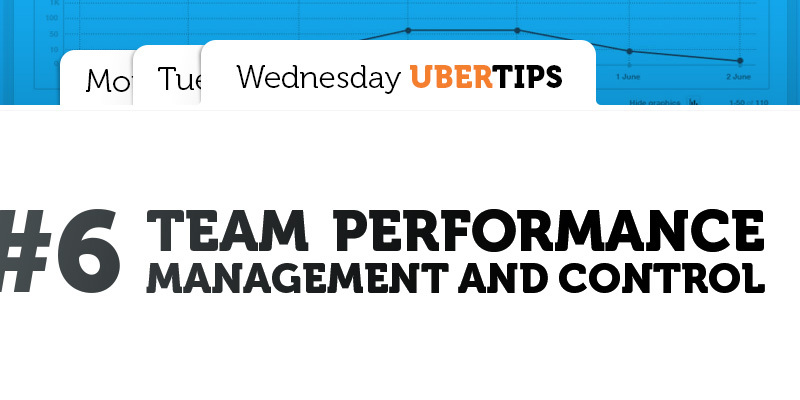 Having Ubertesters at hand, a project manager can save his time and manage testers’ performance efficiently. There is no need to use additional third-party services or check tons of emails with the testers’ reports. 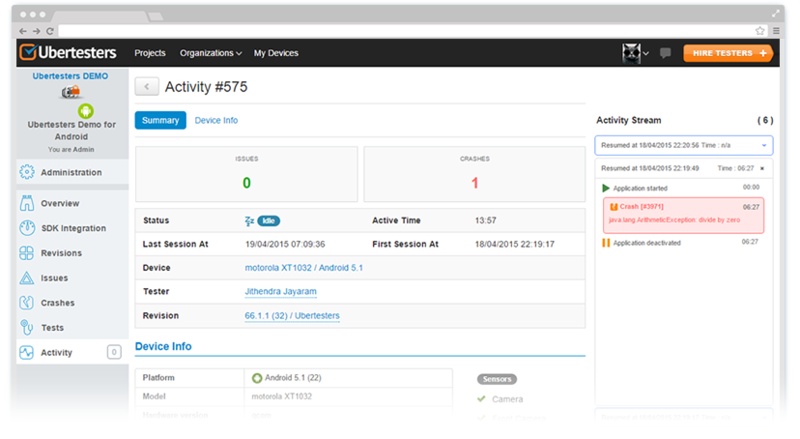 Just access your account web-interface and check all the necessary data about the testers, their devices and activity. Will your app survive this Christmas shopping season?